DataEthics is a politically independent ThinkDoTank based in Denmark with a European (and global) outreach. We work to promote data ethical products and services and provide knowledge, collaboration and consultation on data ethics for businesses, educational institutions, organisations, individuals and decision-makers from a technical, organisational, legal as well as social perspective. The mission is constructive and action oriented in nature and supports knowledge exchange and creation and cooperation on a sustainable and data ethical future with individual citizen control at the centre. The ThinkDoTank was founded in August 2015. It is run by four female team members, with an interdisciplinary Advisory Board and an international core team. 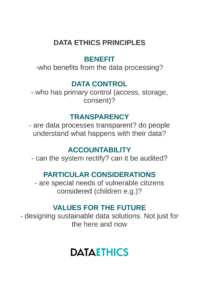 The last couple of years DataEthics has focused on creating a knowledge foundation and network for an ethical data business and policy approach. We do this by mapping and promoting alternative privacy tech, human centric and ethical data driven solutions; with conferences; representation in various EU and global initiatives/conferences; and content production (such as our newsletter and website). We are also currently actively involved in the shaping of data ethics standards initiatives and networks. DataEthics was created in reaction to the current data driven online development characterised by invisible data processing where people have no control nor insight into the interests behind, no knowledge of how their data is used and with what consequences it has for them as individuals. Our laws have not followed pace with the technological evolution, which means that legally you can today do a lot with data that is not in the best interest of the individual. This leads to an increasing data asymmetry and information power imbalance, which is a democratic problem in essence. In DataEthics we want to inspire, be practical and constructive, and therefore we use business cases in our work (e.g. in information material and conferences). We don’t represent these companies, nor do we endorse all their company practices. We select the cases as examples of specific company practices, trends and approaches that are shaping a data ethical paradigm shift. We are in a beta phase and not one company has yet found the optimal solution. Every beginning takes time, just as it did with the products and companies that arose from the first inkling of environmental awareness. Currently DataEthics is formally established as a voluntary association (“frivillig forening”) in Denmark with a limited budget. Our events are sponsored ad hoc. We do not accept sponsorship from companies that we consider not to handle data ethically. The ThinkDoTank receives a fee for new Danish members of Danish IT Association that signs up via DataEthics. This covers basic administration costs. We sometimes individually take a fee plus travel expenses for talks and keynotes at conferences to cover our time. Payments for the book Data Ethics – The New Competitive Advantage go directly to the authors of the book. In October 2018 DataEthics received a grant to develop the organisation from the Foundation Open Society Institute in cooperation with the Information Program of the Open Society Foundations.